My beautiful great niece celebrated her 1st Birthday this past weekend. I can't believe she's a year old already. I made her a card with the Balloon Celebration Bundle set from Stampin' Up!. 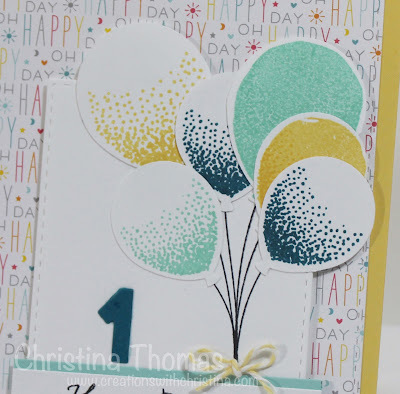 What I love about this set is you can layer up the balloon images or just use them individually like I did on this card. 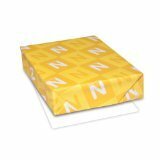 The card is a standard A2 size card (4-1/4" x 5-1/2") made with a card base of So Saffron cardstock. I used my favorite Simon Says Stamps stitched rectangle dies to cut some older Lawn Fawn pattern paper, and with a smaller die from the same set I also cut some Neenah Solar White cardstock for the focal point of the card. I combined both the solid balloons and gradient style for the bouquet. To finish off the card I stamped the sentiment from the Balloon Celebration set and backed it with Aqua Mist cardstock from Paper Trey Ink. 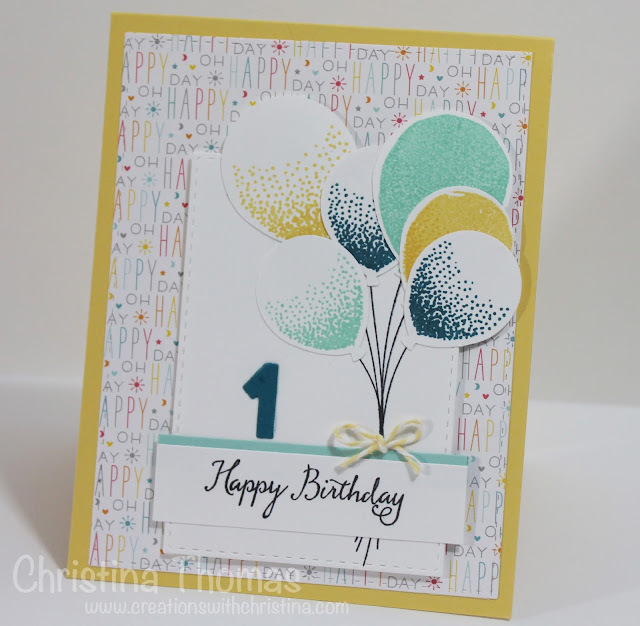 The little #1 is die cut with Island Indigo cardstock using the Modern Numbers Die set from PTI. For a small amount of texture I also added a little yellow baker's twine bow. I'm jumping on the Misti bandwagon and have pre-ordered the mini Misti stamp tool. I know already this is going to be great for lining up images on die cuts and with stamp sets that layer like this one. I'm terrible at layers and stamping straight. There is a larger version of the Misti that has been out for a while but I was convinced I didn't need it. I think I might have been wrong hehe. Is it March yet? I love all the soft and happy color! Love the balloons effect. great job! Fabulous card Christina! 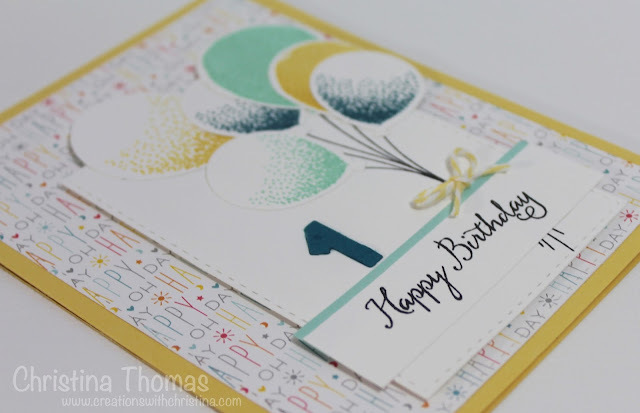 Love the patterned paper you used...it's perfect! Love your card. You are going to be head over heels for the MISTI. I've had mine for about a year (the full size one) and have found myself reaching for it whenever I have to stamp anything. Charming card! I have had my Misti for over 1 year and I love using it. It makes stamping so much easier for me! I know that it will be fun for you, too.